Hit down on the ball to ensure crisp contact. 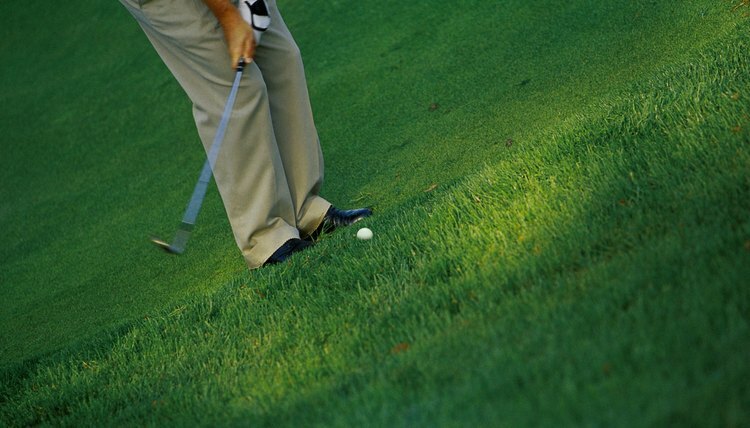 The short game is one of the most important parts of a successful round of golf. When you work on your chipping, try to develop a level of confidence that will allow you to chip when you need to and putt when it's time to putt. The worst thing you can do is allow your chipping to get so bad that you risk using the putter when you know it's time to chip. One of the biggest mistakes people make when they chip is going right for the pin. More often than not, you will wind up sailing your ball past the flag and off the other side of the green. Choose a target in front of the pin and try to land your chip at that point. Since the ball will be rolling after the chip, try to land the ball to use the breaks in the green to get the ball as close to the pin as possible. A good rule of thumb: pick a spot six feet in front of the pin to land the ball and allow it to use the break in the green after it lands. Some people use their sand wedge more often than they probably should around the green, but because they know that club so well, they have developed a comfort level and know what they can expect from it. Take the time to work on playing from off the green with your pitching wedge, your sand wedge, your putter and any other chipping clubs you have to know what kinds of results you can expect. You'll inevitably develop a preference for one club, but understand all of your chipping clubs and know what your limitations are with each. If you watch enough professional golf, you will see the pros backing off of a chip after looking the shot over for a very long time. Sometimes you can over-analyze a shot and get yourself out of rhythm. Line up your chip, decide which path you are going to take with the ball, decide on a club and then approach your shot. Become comfortable with your stance and the lie of the ball, and then swing the club. Chipping is about feel, not thinking. If you take the proper steps to line up your chip, the rest is all in the execution.